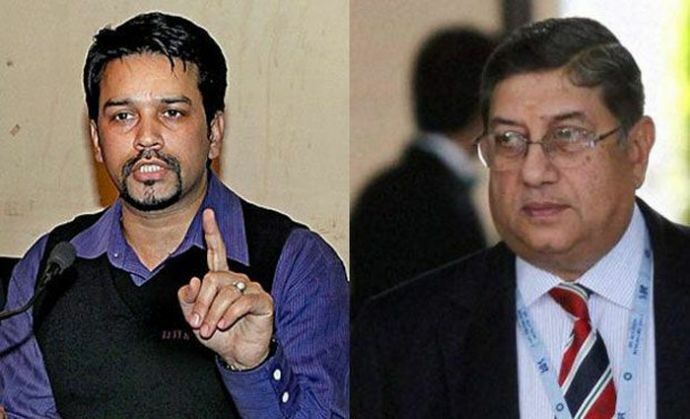 As the Board of Control for Cricket in India (BCCI) gears up to choose its new president on 4 October, former chief N Srinivasan's scathing attack on its secretary Anurag Thakur has exposed the rift within the world's richest cricket board. The ongoing legal tussle between Srinivasan and the current BCCI leadership took an ugly turn after the ICC chairman filed a fresh plea seeking criminal prosecution against Thakur under perjury charge over his "false affidavit" and "plethora of misleading" statements in the Supreme Court. The BCCI had recently moved court to seek legal clarification on Srinivasan's ability to attend its meeting as the Tamil Nadu Cricket Association (TNCA) president amid allegations of conflict of interest. Thakur had supported the application against Srinivasan, stating that it was drafted under his instructions. In the application, the BCCI secretary had claimed that Srinivasan had barged into the Kolkata workign committee meet on 28 August and insisted upon attending the meeting. The meeting was later adjourned by the former BCCI chief Jagmohan Dalmiya, who passed away on 20 September. According to a report published in The Indian Express, Srinivasan has countered the claims of Thakur and termed his affidavit as "completely false." The ICC chairman has also submitted affidavits of BCCI treasurer Anirudh Chaudhary, BCCI vice-president TC Mathew and board's joint-secretary Jayesh George to falsify Thakur's averment. The three affidavits submitted by Srinivasan claimed that he was already seated when the BCCI meeting began and nobody objected to his presence. Further, the meeting got adjourned sine die without any discussion and hence there was no occasion for Srinivasan to declare he has no conflict of interest as mentioned in the BCCI's application, as per the plea. "The averments in the false (BCCI) application can then only be personal to Anurag Thakur, who has abused the process of this court by filing his personal false affidavit in the garb of an affidavit on behalf of the BCCI," Srinivasan told Indian Express. The report also suggests that Srinivasan has also accused Thakur of sensationalising BCCI's position in his plea as he "sought to create a confusion between him and his namesake, another N Srinivasan, who is a former partner of a chartered accountancy firm in Chennai." Srinivasan's plea, seeking charges under Sections 193 and 209 of the Indian Penal Code, can land Thakur in trouble, with a maximum of seven years in jail.